"Your guide to staying healthy, fit, and active on the road." Fasten your seatbelts. Prepare for a journey back through time. A journey much like H. G. Wells described in his classic 1895 novel, The Time Machine. We will rewind the clock to a typical post-revolutionary New England village and experience first hand how America’s original citizens lived and worked. You simply climb into your own time machine--your RV--push a button or two and steer it for Old Sturbridge Village in south central Massachusetts. When you emerge from your time capsule you will discover villagers dressed in quaint but practical handmade garments strolling the streets, tending the gardens of their wood-clapboard homes, and trading with merchants and craftsmen in the bustling shops. Plodding teams of oxen pull simple single-bladed plows turning furrows on the Village’s rolling farmland while cows and sheep graze contentedly in the pastures. Before your arrival, and even before David Wight began farming his land in the early nineteenth century--where Old Sturbridge Village now stands--Pogus Mountain behind the meetinghouse was inhabited by wolves, bears, and wildcats. But before long Wight had cleared the land and erected a sawmill and gristmill. He created a millpond by diverting water from the nearby Quinebaug River, and was well on his way to establishing a prosperous farm. This was not labor to be taken lightly, as farmers had only pickaxes, handsaws, and oxen with which to clear the trees, pull the stumps, fill wetlands, and haul tons of the plentiful rocks from the land. From the late 1700s through the early 1800s central Massachusetts farmers expanded the cleared land from one quarter to two-thirds of the county’s land total, not only for pasture and cropland but for lumber to provide for the building boom as farmers built homes and barns. In the late 1840s, a young George Washington Wells applied his New England bred ethic of hard work to turn his humble spectacle shop in nearby Southbridge into the hugely successful American Optical Company. His three sons, who not only followed him into the business and continued the company’s growth, but also took up the passion of collecting antiques, crafts, clocks, and other memorabilia of rural New England living. In 1935 the family established the non-profit Wells Historical Museum that took possession of the burgeoning collection, amounting by then to tens of thousands of articles and artifacts, with plans to display their collection to the public. But opening a museum was not enough for the Wells family, who embraced the idea that the most effective learning resulted from direct experience and participation. This concept evolved into the replication of a typical New England village as a living outdoor museum, with authentic rural style clapboard houses, unpaved country roads, a functioning farm with period tools, and costumed craftsmen producing buckets, cooking pots, candles--all those items used by villagers and farmers in their daily lives. They would grow a garden of medicinal herbs and vegetables, grind grains into flour, and tend barnyard and pasture animals. And David Wight’s farm of rolling meadows, forested hillsides, and flowing stream was the perfect location. After ten years of planning, buying and transporting old buildings to the site, and plenty of hard work their dream venture was ready. On opening day, June 8, 1946, the twenty-five costumed towns people and behind the scenes staff welcomed 81 visitors at an admission price of $1. Today Old Sturbridge Village, what the Saturday Evening Post called "The Town That Wants to be Out of Date," entertains nearly a half million visitors annually. Stroll around the village and you can see how grandmother spun thread for the family’s clothing, help her prepare a meal and taste some of her fresh baked bread, and see what vegetables she grows in her back yard. Most villagers tended gardens where they grew not only things to eat, but also a variety of medicinal herbs and plants, which were believed to cure everything from the common cold to deadly viruses: Rhubarb for rheumatism, catnip to calm children, and Queen Anne’s lace to dissolve kidney stones. (You can watch and help prepare an herbal remedy at the Fitch House). Visit the award winning herb garden to see many of these plants and for special programs on gardening and herb cultivation. Venture out into the fields and watch farmers till the fields with simple handmade tools. Milk a cow, ogle an ox, or chase a chicken. Head for the blacksmith shop where, as New England poet Henry Wadsworth Longfellow described "the smith a mighty man is he, with large and sinewy hands" pounds red-hot iron into tools and horseshoes, and visit the potter who turns muddy clay into cups and bowls. Visit the village jeweler for a trinket for milady, shop for a new lantern at the tinsmith’s, and visit the print shop, where the printer can show you proudly how he and his staff of nine can print as many as 2400 sheets a day. You will experience first hand the importance of New Englanders’ belief in the virtues of hard work, diligence, and thrift, and how families could overcome the hardships of settling in the New World by exercising individual resourcefulness and independence. At special demonstrations you will learn how to shear a sheep, press apples into cider, and how to make that delicious maple syrup you slather on your pancakes and waffles. Watch the mills grind grain into flour, saw trees into lumber, and watch skilled craftsmen and artisans at work—all in period costume and using genuine tools and artifacts. 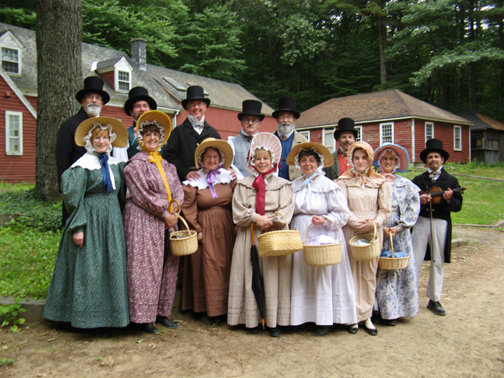 Enjoy a hearthside dinner of the same healthy food enjoyed in the 1830s, then stroll about the village common keeping an eye out for Daniel Webster or P. T. Barnum while the town gossip brings you the latest chitchat. For a special treat, plan on attending a Village Tavern Evening, held every Friday from 6:00 to 10:00 PM at Bullard Tavern. Mingle with costumed characters in a celebration of food, fun, games, and entertainment, including a dinner in the traditional manner of Yankee hospitality. The taproom, or bar, in those days was a place where men gathered to unwind from the rigors of work, to talk livestock, crops, and politics, and where--since women were not allowed—they could relax their usual proper conduct and drink, spit, gamble, play cards, and get rowdy, like wearing their hats indoors, slouching in their chairs, and smoking cigars. Today Village Tavern Evenings have broken with the "men only" tradition and welcome everyone to the somewhat toned down "tumult and clamor" of tavern taproom proceedings. Following drinks and conversation in the taproom, guests enter the dining room for a dinner of clam chowder, herbed chicken or country beef, potatoes and vegetables, with gingerbread and lemon sauce or deep-dish apple pie for desert. One of the dinner guests might even be George Washington. Musicians provide period music and following dinner you will be entertained with a round of storytelling, games, or a puppet show. (The fare for a Village Tavern Evening is $28). Elderhostel also conducts several weeklong programs on subjects from gardening to tinsmithing. Old Sturbridge Village portrays a historically accurate period frozen in time, the first 50 years--1790 through 1840--of the new nation of America. It was a time of great change, of transition from the small family farm, from hand made tools and household articles, homespun clothing, and bartering as the chief form of trade. Though a family could still support itself on a small farm, village youth were being lured away by paid employment in the mechanized textile mills that were springing up all over New England. Northeastern factories were producing mechanized tools and equipment and cheap products that would replace the village cooper, chair maker, and blacksmith. Oxen, though the mainstay of the family farm, would gradually be replaced after 1840 as horses moved faster and were more versatile in pulling the new mechanized farm equipment. Cash replaced bartering as housewives found that they could buy flour from Ohio and Western New York cheaper than they could grow it on their own farm, and affordable cotton garments made home spinning obsolete. Since wool was no longer in demand, sheep disappeared. The early 19th century paintings that show miles of forest-less landscape dotted with grazing animals and rows of crops is a sight you will not see today. The forests that had been cut to provide pasture and cropland would reclaim much of the unused land. The old ways, though clung to by many in the countryside, were succumbing to progress. At Old Sturbridge Village, however, progress has been halted. The small family farm and blacksmith and bakeshop and tinsmith and shoemaker still thrive, frozen as living icons in the proud history of New England and the new country of America. Old Sturbridge Village is located in Sturbridge, MA on Route 20 just off the Massachusetts Turnpike. Phone: 508-347-3362 or 1-800-SEE-1830. Internet: www.osv.org.